Thanks to you I kept reaching my goals faster and faster and was able to share them with others. Constantly listening to your words, trying to hear something that would allow me to walk my own path, avoid unnecessary mistakes and concentrate on what is good. Every morning and every evening I pray to be a good husband, father, son, co-worker, manager, leader, but first and foremost, a better HUMAN BEING. but people of great spirit talk about ideals. Striving for ideals was and still is my top priority and the essence of a fruitful life. There was a moment in my life where one of my ideals was shattered. I got to experience how a person feels when hit by such a situation: what they think, what kind of questions they ask themselves and what answers they get. I got to know the feeling of a man being able to negate his whole life until that moment, his values and his beliefs. Today, thanks to this experience, I can view the world surrounding me in a better way. I can reach conclusions that make me mentally stronger and more powerful psychologically. They let me control my emotions and my stress levels; they allow me to view the surrounding world from a distance and spot the best in people. I was able to fully understand what values are, what life means and what its purpose really is. I got to feel the importance of fundamentals on which to build one’s “here and now”. I noticed how important the people you surround yourself with really are. I got to see what it means to make a conscious decision for myself and for others, from another perspective. Why the will to help other people should be the key element of all our actions. I know today that what you want to have is less important than who you really want to be. If you don’t know who you want to be, you will let other people impose their values onto you and these will in turn make you suffer. they say and what they do is the essence of a fruitful life. You are probably wondering where the title of this book originates from. 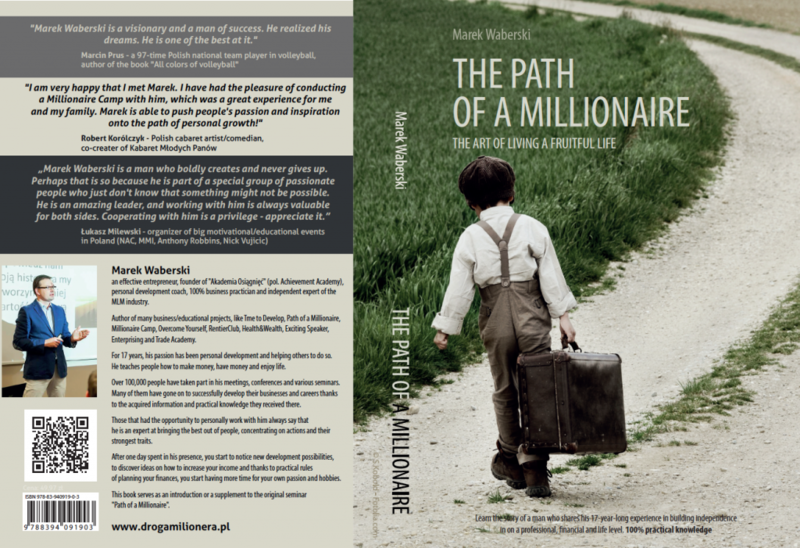 First and foremost, it’s connected to the path that I walked personally – the path from zero to hero, or in this case, from rags to riches. The path that allowed me to prove that impossible things do not exist. If you work on your skills and develop the right ones, you can shape the personality of a person that can notice opportunities in the market, be successful and live life to the fullest. This is what I was taught by my guides in life. I listened to them, worked on myself, developed the right skills, created good habits and changed my way of thinking. But first and foremost, I took action. With my attitude, I proved that it’s possible. This path is for every person that wants to MOVE FORWARD and is ready to take on newer and newer challenges. That is what I will be talking about in this book. I invite you to join me on a journey into the world of dreams, accomplished goals, interesting experiences filled with faith in the next person, their capabilities and their willingness to strive for excellence.